Portland, Oregon, is located on the Willamette River, approximately 10 miles upstream from the Willamette's confluence with the Columbia River. Historians are uncertain as to when Portland was first established. 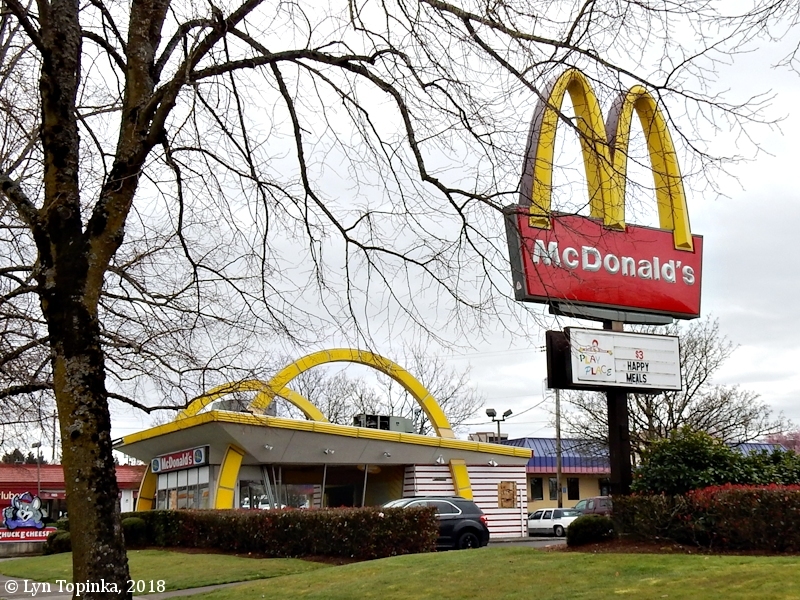 Records show a settler Etienne Lucier may have settled in what was later East Portland in 1829, and in 1842 a William Johnson had a cabin at what is now SW Macadam Avenue and Curry Street. A.L. Lovejoy and William Overton landed at the site of Portland in November 1843 on their way from Fort Vancouver to Oregon City. They returned and took a land claim of 640 acres. 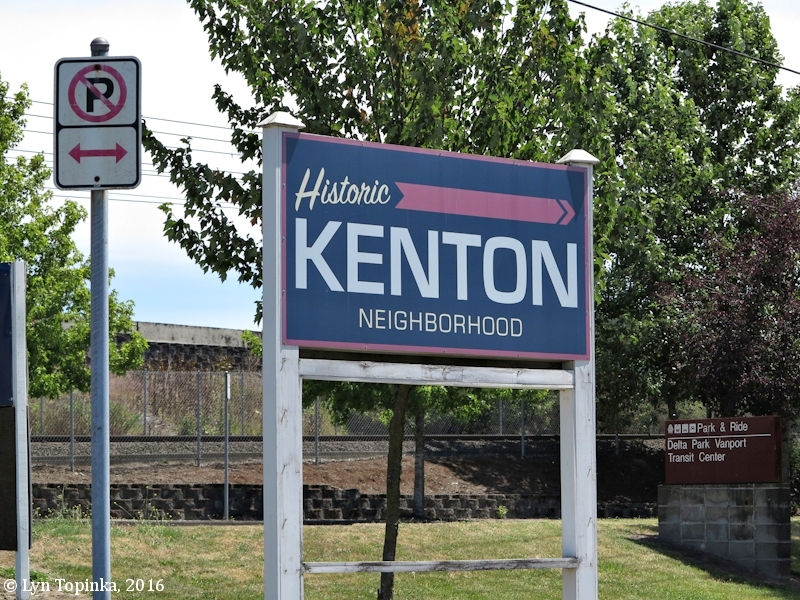 In 1844 Overton sold his part of the land to Francis W. Pettygrove, who had arrived at the Columbia River in 1843. 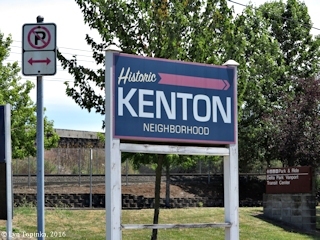 In 1845, Lovejoy (from Boston, Massachusetts) and Pettygrove (from Portland, Maine) laid out 16 blocks of a townsite, flipped a coin as to which hometown would be honored, and Portland, Oregon, was born. The Portland Post Office was established in November 1849. Today the city of Portland is the largest city in the state and it's metropolitan boundaries stretch to the Columbia River. Mount Hood, a Cascade Range Volcano, looms over the city. The Portland International Airport lies on the northeast side of the city and once was the location of a large "Skil-loot" village visited by Captain Clark in 1806. On April 2, 1806, Captain Clark camped at the location of today's St. Johns Bridge across the Willamette, just north of downtown Portland. 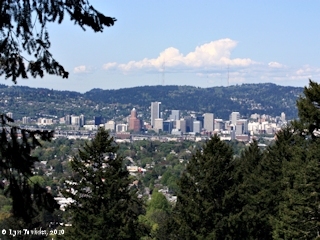 Portland was dubbed "The City of Roses" during the 1905 Lewis and Clark Centennial. The Portland Auditor's Office website suggests a bit different history for the moniker "City of Roses". Another common name used to represent Portland is "Rose City". 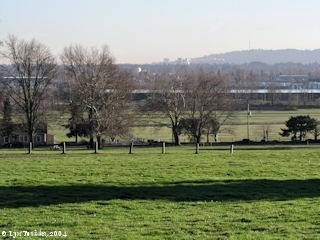 Click image to enlarge Portland, Oregon, just visible in the distance, as seen from Jolie Prairie, Vancouver, Washington. The Columbia River can be seen in the middle of the image. Image taken March 8, 2004. The Boring Lava Field surrounds Portland. Rocky Butte, one of the better known of the Boring Lava Cones, is located east of downtown Portland and is a good location for views of Washington State, the Columbia River, and the city of Portland. Good views of Portland and other Boring Lava Cones can also be had from the Willamette National Cemetery, south and east of Rocky Butte. Click image to enlarge Boring Lava Cones east of Portland, Oregon. View from the Interstate 205 Bridge crossing the Columbia River. Image taken August 30, 2006. 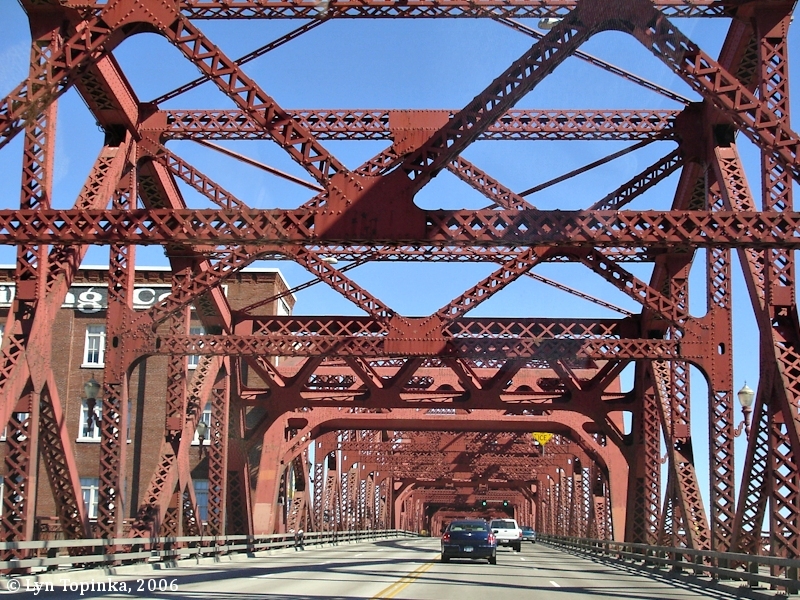 According to "Bridgehunter.com" website (2018), the Broadway Bridge is a Rall-Bascule lift bridge crossing the Willamette River at Willamette River Mile (RM) 11. The bridge was built in 1912 and rehabilitated in 1927. It was the first bascule span built in Portland, and, at the time it was constructed, it was the longest Rall-Bascule lift bridge in the United States. The Broadway Bridge's largest span is 304.1 feet in length with the total bridge length being 1,742.2 feet. Deck width is 45.6 feet. In 2012 the Broadway Bridge was listed on the National Register of Historic Places (#12000930). Click image to enlarge Broadway Bridge, Portland, Oregon. Image taken September 24, 2006. 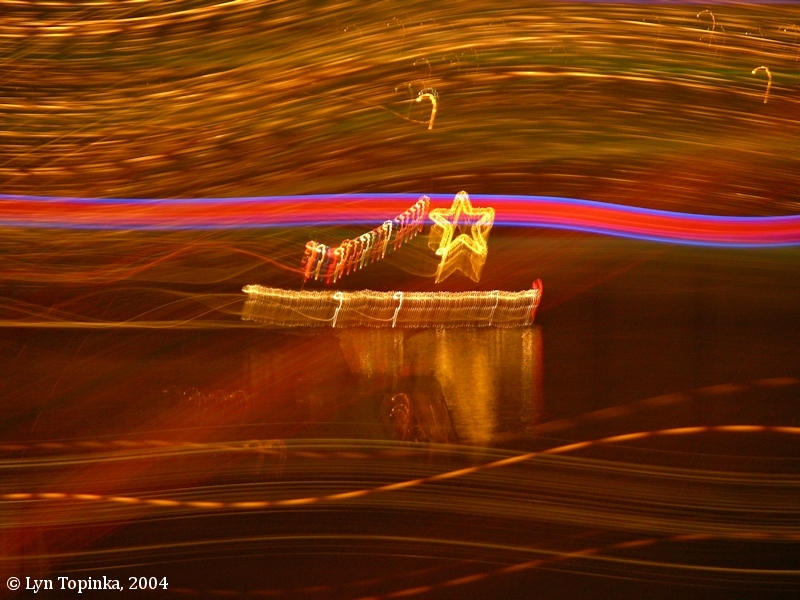 The year 2004 marked the 50th anniversary of Portland's Christmas Ships. What began with one ship back in 1954, now consists of 50-60 ships sailing nightly for two weeks up and down both the Columbia River and the Willamette River. Each night they sail a different section of rivers, from Washougal, Washington to Scappoose, Oregon. 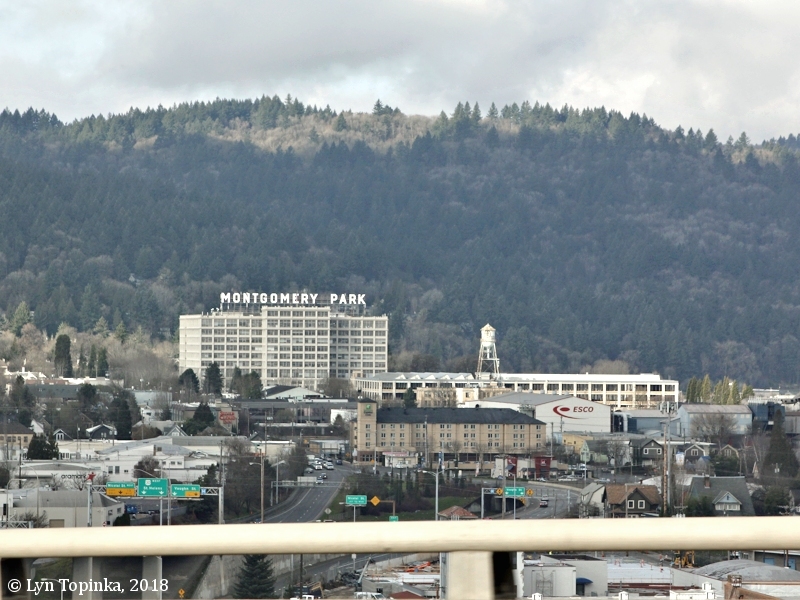 Highlights of the season are sailing around the Interstate 5 Bridge, nights which pack the riverside restaurants and motels full. 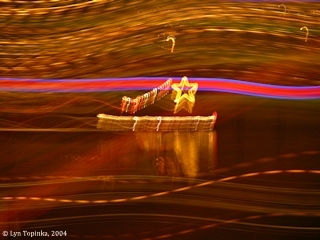 Click image to enlarge Christmas Ships - "Modern Art". View on the Columbia River from Washougal, Washington, Marina. Image taken December 19, 2004. 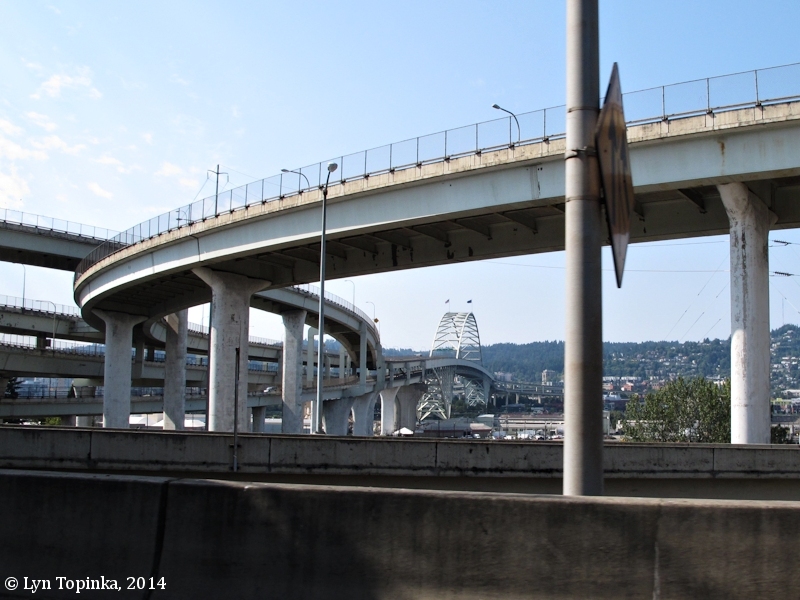 The Fremont Bridge crosses the Willamette River at Willamette River Mile (RM) 11. The Fremont Bridge and it's associated Fremont Street were named for explorer John C. Fremont, who explored the Oregon area in 1843 and 1844. 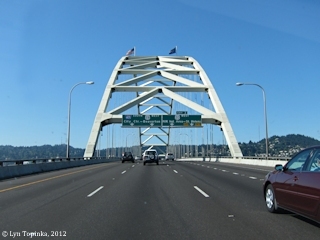 According to "Bridgehunter.com" website (2018), the Fremont Bridge is a steel through arch bridge built in 1973. 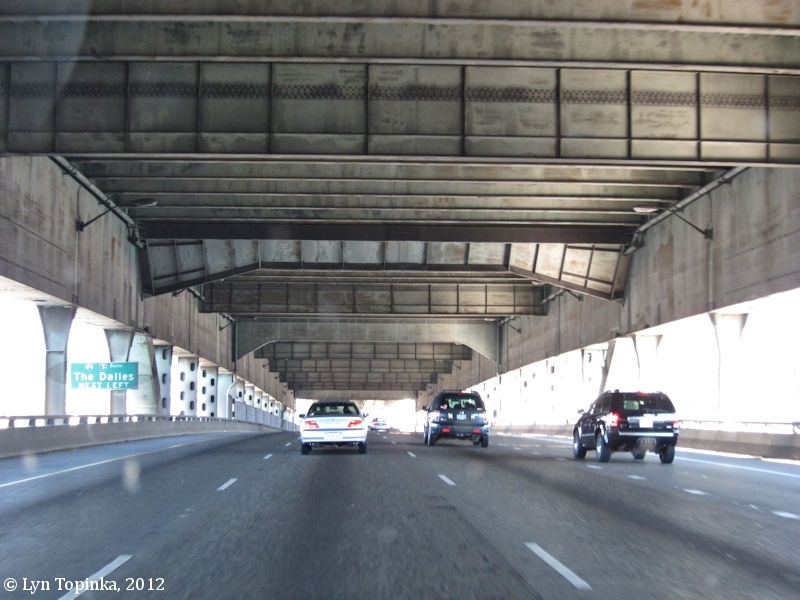 Its largest span is 1,255.3 feet in length with the total bridge length being 2,149.0 feet (0.4 miles). Deck width is 68.0 feet. Click image to enlarge Fremont Bridge as seen from Interstate 5, Portland, Oregon. Image taken August 24, 2014. 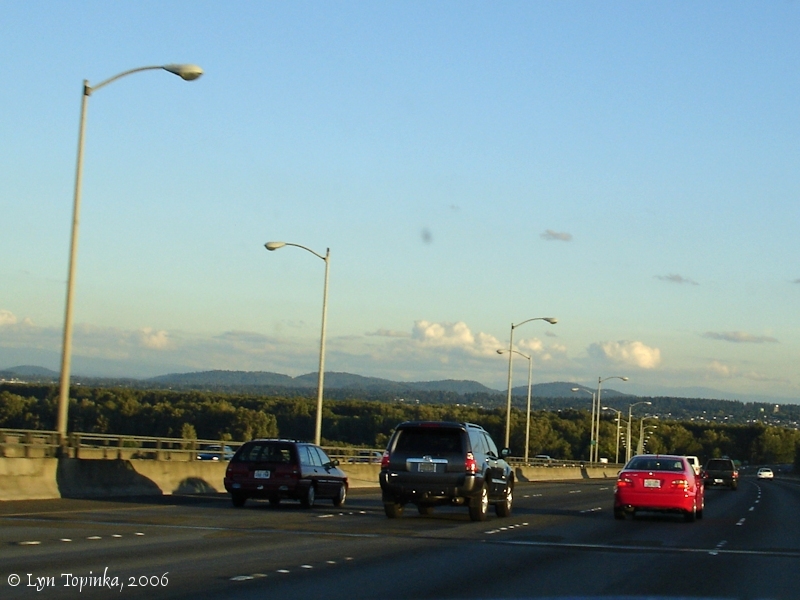 Click image to enlarge Mount Hood, the Willamette River, and Portland, Oregon, as seen from the Fremont Bridge. View looking south, from the lower deck of the Fremont Bridge. 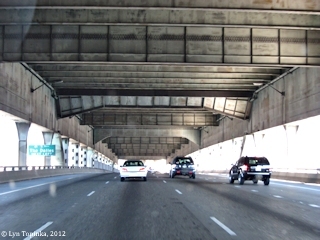 Image taken June 10, 2012. 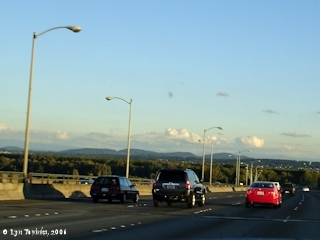 Click image to enlarge Crossing the Fremont Bridge, heading west, Portland, Oregon. Upper deck. Image taken September 4, 2012. 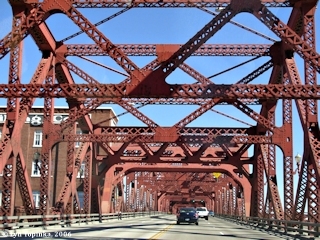 Click image to enlarge Crossing the Fremont Bridge, heading east, Portland, Oregon. Lower deck. Image taken October 7, 2012. Portland, Oregon, hosted the 1905 Lewis and Clark Centennial Exposition, a "World's Fair" to mark the 100-year anniversary of the Lewis and Clark expedition. 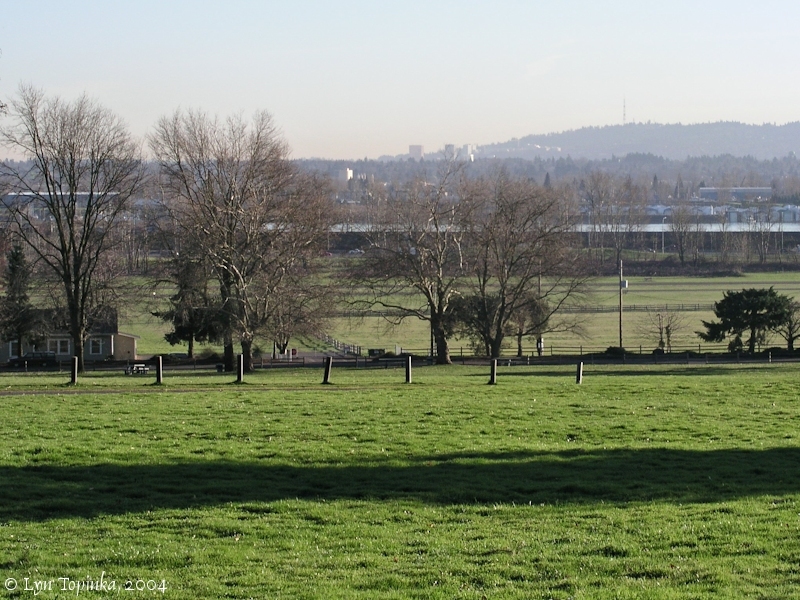 The exposition was built on land created by filling in Guild Lake in Northwest Portland, next to the Willamette River. The Forestry Building won acclaim as "the world's greatest log cabin." Penny Postcard: Lake View Terrace, Lewis and Clark Exposition, 1905, Portland, Oregon. Caption on top reads: "Official Mailing Card Lewis & Clark Centennial, 1905, Portland, Oregon". Published by B.B. Rich, Official Stationer. View shows Guild Lake on the right. In the private collection of Lyn Topinka. 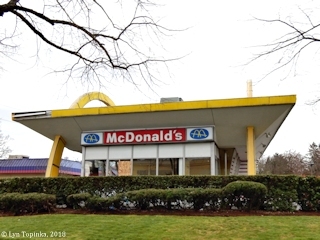 Portland's iconic "Golden Arches", located on SE 91st Avenue and Powell Boulevard, was built in 1962. It is in the process (March 2018) of now being torn down. 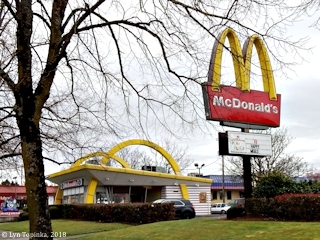 Click image to enlarge McDonalds, 91st and Powell, Portland, Oregon. Image taken March 15, 2018. In a new concept of "mail-order" business, the Montgomery Ward warehouse was built in west Portland on the site of the 1905 Lewis and Clark Centennial Exposition. In 1985 the "Montgomery Ward & Company" building was added to the National Register of Historic Places (Event, Architecture/Engineering, #85001184). Initially constructed in 1920 for 1.5 million, the building was expanded in 1936 by 230,000 square feet, and in its heyday, employed 1000 employees. ..."
Source: "Montgomery Ward & Company" National Register of Historic Places Nomination Form, 1985, #85001184. Click image to enlarge Montgomery Park, Portland, Oregon. View from the Fremont Bridge. Image taken February 10, 2018. 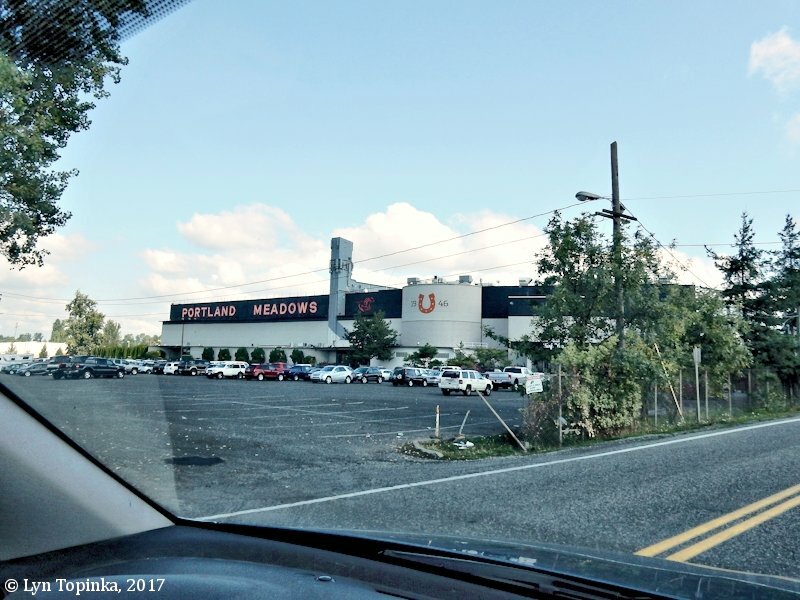 "The City of Portland sits at the confluence of the Willamette and Columbia rivers and occupies the western half of the Portland Basin and much of the adjacent Tualatin Mountains. The flat floor of the Portland Basin is punctuated by several small buttes and the Boring Hills, a complex region where small volcanic cones mix with blocks uplifted by faulting. The Tualatin Mountains, a straight and narrow range with a sharp, fault-bounded eastern edge, separate the Portland Basin from the Tualatin Basin to the west." Source: Ian P. Madin, 2009, "Portland, Oregon, Geology by Tream, Train, and Foot": Oregon Geology, vol.69, no.1, Fall, 2009, Oregon Department of Geology and Mineral Industries, Portland. Click image to enlarge Portland Meadows Racetrack, Portland, Oregon. View through front window of moving car. Image taken October 2, 2017. The first "Portland Rose Festival" was held in 1907. Penny Postcard: "City of Roses", Portland, Oregon, ca.1916. Penny Postcard, Postmarked 1916, "Beautiful Homes and Side Walks Lined with Roses, Portland, Oregon.". Published by Lipschuetz Company, Portland, Oregon. Card #289. April 4, 1916, date is handwritten on back. In the private collection of Lyn Topinka. Penny Postcard: Portland Rose Festival, Portland, Oregon, ca.1909. Penny Postcard, Postmarked 1909, "Forestry Building, Rose Carnival, Oregon.". The Foresty Building was built for the 1905 Lewis and Clark Centennial and left as a memorial to the explorers. Published by E.P. Charlton & Co., Portland, Oregon. In the private collection of Lyn Topinka. 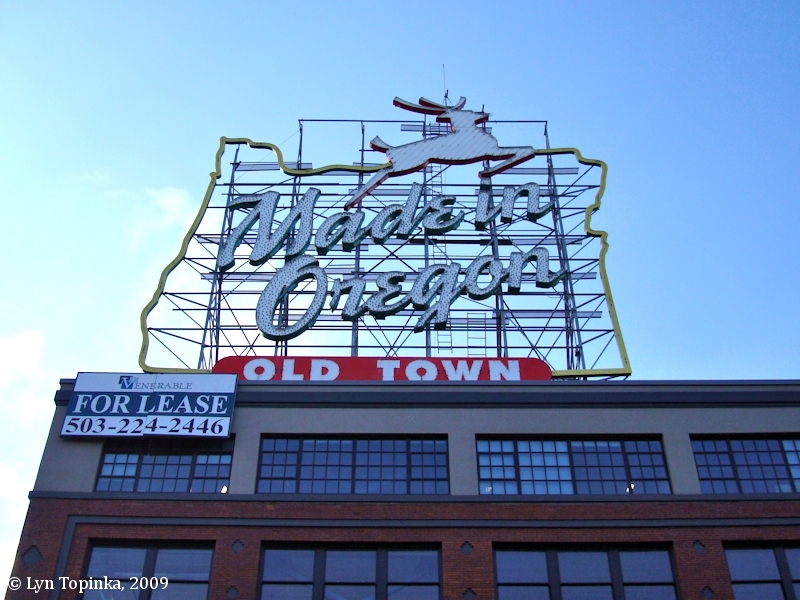 Portland's "Made in Oregon" sign is part of the "Portland Skidmore/Old Town Historic District, listed in 1975 on the National Register of Historic Places. 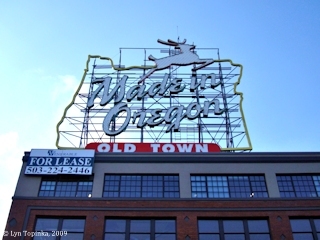 Click image to enlarge "Made in Oregon" Sign. Image taken February 14, 2009. 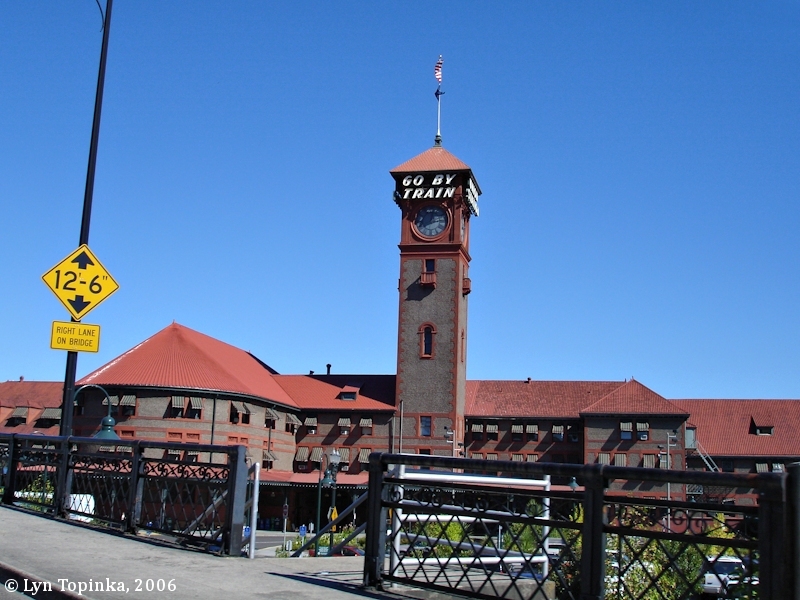 Portland's Union Station once had on display the Oregon Pony, the first steam engine in the Pacific Northwest. The Oregon Pony hauled passengers and freight at the portage at Cascade Locks on the Columbia River. The early 1900s was the "Golden Age of Postcards", with the "Penny Postcard" being a popular way to send greetings to family and friends. Portland was a popular view and thousands of images exist. Penny Postcard: Portland, Oregon, and Mount Hood, ca.1905. Penny Postcard, ca.1905. Caption reads: "City of Portland & Mt. Hood." Published by B.B. Rich, Official Stationer. Card is in the same style as offical cards from the 1905 Lewis and Clark Centennial. In the private collection of Lyn Topinka. Penny Postcard: River Front, Portland, Oregon, 1899. Penny Postcard, Copyright 1899 by H.A. Hale, "River Front, Portland, Oregon." Card #5914. Card is postmarked October 19, 1904. Undivided back. In the private collection of Lyn Topinka. Penny Postcard: War Vessels, Portland Harbor, Portland, Oregon, ca.1910. Penny Postcard, ca.1910, "U.S. War Vessels in Harbor, Portland, Ore.". Published by M. Rieder, Los Angeles, California. Card #3945. In the private collection of Lyn Topinka. Penny Postcard: Portland Harbor, Willamette River, Portland, Oregon, ca.1920. Penny Postcard, ca.1920. 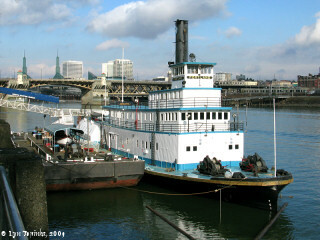 Caption on the front bottom reads: "Shipping Scene, Portland, Oreg.". Caption on the front top reads: "Grain, Lumber, Flour, Fruit, etc., to All Parts of the World.". Caption on the back reads: "Steamship lines ply from the city to the Orient and to all Pacific and Atlantic Coast ports. Tramp steamers and sailing vessels carry lumber, grain, flour, fruit, etc. to world-wide markets. Large foreign shipping houses have branches here. The harbor is in the heart of the city, and vessels dock close to warehouses." Published by Chas. S. Lipschuetz Company, Portland, Oregon. Card #274. In the private collection of Lyn Topinka. Penny Postcard: Aerial view, Portland, Oregon, and the Willamette River, ca.1930. Penny Postcard, ca.1930, Portland, Oregon. Caption on front reads: "View from a Skyliner over Willamette River, Looking North Toward Mt. St. Helens, Wash." Caption on back reads: "Portland, 'The City of Roses.' Population 325,000, a city rich in attractions and charm for the visitor. Beautiful parks, delightful drives and points of historic interest dot nearly every section of the city. It is not only a vacation center, but a thriving industrial city of 600 plants, producing for home and foreign markets. It has a fresh water harbor and is a major seaport." Image copyright Brubaker Aerial Surveys, Portland, Ore. Published by Wesley Andrews Co., Portland, Oregon. Card #749. In the private collection of Lyn Topinka. Penny Postcard: Mount Hood and Portland, Oregon, ca.1940. Penny Postcard, ca.1940. Caption on front reads: "Mt. Hood, from Portland, Oregon". Caption on back reads: "Portland, Oreogn. 'The Rose City'. Mt. Hood (Altitude 11,225) in background. Population 500,000." Published by Angelus Commercial Studio, Portland, Oregon. Card #3. In the private collection of Lyn Topinka. Penny Postcard: Portland, Oregon, Public Market, and Seaplanes on the Willamette River, ca.1940. Penny Postcard, ca.1945. Caption on the front reads: "$1,000,000 Public Market on Portland Harbor, Showing Patrol Boat and Seaplanes, Portland Oregon." Caption on back reads: "One Million Dollar Public Market, Portland, Oregon". Published by Angelus Commercial Studio, Portland, Oregon. Card #31. In the private collection of Lyn Topinka. The 220,000-square-foot Portland Public Market opened in 1933 and closed in 1942. In 1943 it was leased to the U.S. Navy, and in 1948 it was taken over by the Oregon Journal News, a paper eventually bought out by the Oregonian. In 1969 the Public Market was demolished and the area became the Tom McCall Waterfront Park.